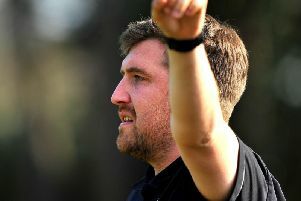 Horsham manager Dominic Di Paola reckoned his side wasted their chances and did not play well enough against Herne Bay. He was frustrated all-round as Hornets actually had the ball in the next which was ruled to be offside, then fluffed a golden chance to clinch a draw. Di Paola said: “I didn’t think we we at our best, I don’t think we played particularly well. “We had some chances and could have had a point from playing badly and we didn’t take them. “We switched off for ten minutes, let in two bad goals and came away with nothing; that’s all you ever get in this league if you aren’t at your best. Di Paola they didn’t help themselves by conceding two quick goals. He said: “For ten minutes we were appalling and we have conceded two goals so we made ourselves a mountain to climb. “We played well after they went 2-0 up but before they scored we gave the ball away six times under no pressure. “It isn’t good enough; forcing the play and giving the ball away. “We gave away a cheap free-kick which they’ve scored off and we didn’t mark their centre forward, of all the players you’d want to mark, who scored a nice, simple goal. “Then from a cheap free-kick, Mets was going to clear it (Steve Metcalf). “We should have come away with a 2-2 draw. I think we scored in the first half - I didn’t think Toby (House) was offside because the ball was played back and some of the other decisions they made (the officials) defied belief. I am not blaming the result on them but they certainly compounded the situation. It was frustrating all-round.